We call on you to urgently lead the world to a humane 21st century refugee policy that saves lives and protects people fleeing war and hunger. This means drastically increasing resettlement and relocation of refugees in a way that reunites families and shares responsibility across Europe, and the world; giving financial and technical support to countries on the frontline of the crisis; and ensuring security actions do not put those seeking sanctuary at risk. The magnitude of this crisis requires united, urgent and massive humanitarian action. 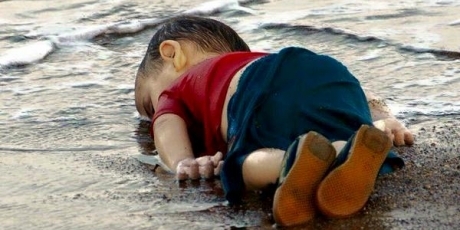 This image of a tiny baby lying lifeless on the shore is, like so many, too heartbreaking to watch. What’s really appalling is that instead of being shocked to take urgent action, our leaders have been stuck in a fighting match on whose problem this is. But for the first time ever, there’s a glimmer of hope for a solution. After massive public calls to welcome refugees, the United Nations are leading efforts to deliver a new, strong global plan that would give refuge to people fleeing war and hunger. By agreeing to another shameful deal with Turkey, the EU has been blocking this emergency action. Whether our leaders lead the world to a humane 21st century refugee plan, or turn their backs, depends on how much they feel the public demands it. That’s where we come in. Right now we are at a tipping point. It’s time for us to lead our leaders. World leaders are meeting in the next few days to set their positions, so there’s no time to lose. Join the call for a plan to give these terrified families safe haven now -- Avaaz will deliver our proposal to key decision makers at the summit.